Oh, Muffie, that remarkable photo has a holiness about it. I live in Pennsylvania. Today is practically a state holiday. It is opening day for antler deer hunting season. I realize that many individuals use the meat and that hunting helps "control" the deer population. I try to feel non-judgmental about the kills. However, for the life of me, I don't understand how standing in a tree stand with a scoped rifle shooting at an unarmed deer in its home environment is a sport. It baffles me that some people take great pride and satisfaction in killing these beautiful animals. I am not wired that way, but I try to respect those that are. Deer in numbers of one or two are a delightful bucolic sight (so long as you're careful to check your clothing for ticks after getting close to them). But deer don't remain in ones and twos for long because they have no natural predators any more to keep their numbers in check. Instead, they have only cars and trucks as "predators," and so their numbers go on increasing without significant limit. 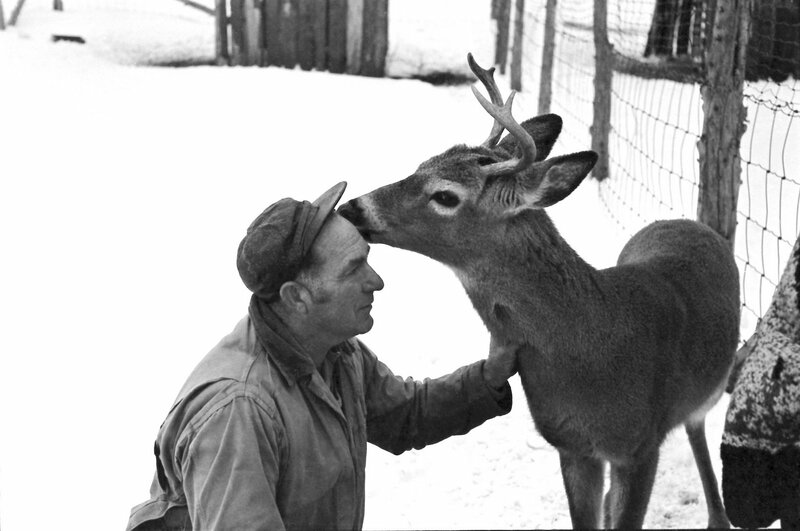 My only objection to hunters is that they go after the bucks for the antlers. The ones they ought to be shooting are the does, who produce litters of several fawns every year. So unless we go with wolves, we should plan on crashing into, or shooting, deer ad infinitum. I absolutely love photographs like this. Thank you Muffie. No deer in the yard today (thank goodness!) but we were visited by 3 turkeys -- a white one, a red one and a black one. Think they are wild birds but they love bird seed! Anon. 11:28: Hunters and fishermen are experientially honest in acquiring their meat and do not shrink from the details. Yes, more genteel to get it pre-cut, irradiated, barcoded and shrinkwrapped at Whole Foods, all that ickypoo unpleasantness delegated to invisible immigrant labor paid under the table. Wonder if that high horse tastes good. . . ! Anonymous 4:51 Some hunters and fishermen are educated and ethical but I've seen way too many photos of men posing for pictures with dead animals and gloating on their kill as if that makes them superior in some way. In addition to Muffie's content, another thing I appreciate about this blog is the reasoned (usually), thought-provoking comments left by readers. Pretty hard to eat meat and be against the legal harvesting of wildlife. Also, the money hunters generate for habitat conservation far exceeds the funds provided from any other source. Hunters and anglers have a connection to Earth and their food that most Americans now do not. I live in suburban Fairfax County, Virginia, about twenty miles from the back door of the White House, and hunting is permitted here. In fact, there will be signs posted to that effect just a few hundred yards from our house. Bow hunting only, of course. We see them frequently. There are beaver in the same area, which are disliked much more than the deer. I've had the misfortune of hitting one deer and one hitting me. The one that hit me drove in the door of my old 240 Volvo but after a few days of fluctuating outdoor temperatures the dent just popped out with no signs of damage. Woodpeckers damaging siding, chipmunks making holes in the yard perfectly sized and hidden for stepping into and of course the reports of an abundance of rabid raccoons keep me conflicted because I do love wildlife. I guess Rodney King expressed my sentiments: "Can't we all just get along?" Love this heartwarming image. Words are not necessary.